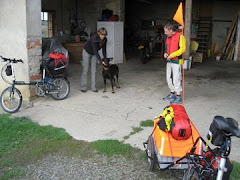 Having written a number of books on cycle touring we are well aware of the problems of both finding and recommending accommodation, or as our American friends say, accommodations. We prefer the quaint old inn, or a good B&B not only because price plays a role, but also if we stop in a chain hotel they are good value for money, but whether one stops overnight in Memphis, Tennessee or Berlin, Germany they are basically the same. Trying to find these from a city's tourist office list can be difficult. In Germany one can use the Bett und Bike information put out by the ADFC, the German Cycle Club, but elsewhere it is not always easy, so I was pleased to come across a website put out by a German travel book publisher giving information about the hotels that their authors have used in almost 30 years of travelling: www.michael-mueller-verlag.de/hotel/index.html. The website can help one find an interesting place to stay.